Kawasaki’s Tom Sykes set a WSB record on Saturday by winning his ninth consecutive race at the Donington Park venue. This followed a crash by his teammate Jonathan Rea near the end of the race, leaving the remaining podium spots to Leon Haslam (Kawasaki – 2nd place) and Alex Lowes (Yamaha – 3rd). Rea bounced back to take the win on Sunday, however, ahead of Sykes in second place and Chaz Davies (Ducati) in third. Despite his DNF on Saturday, Rea continues to hold a sizeable lead in the championship. You will find full Race 1 results here and full Race 2 results here. For additional details, results and points, visit the official WSB site. Another wsbk race this weekend. Let me guess: Kawasaki is bringing their motogp bike for Rea to win on again. Yawn. Haslam coming from BSB and taking second in race 1 was impressive. He should be in WSB next season. Wow! 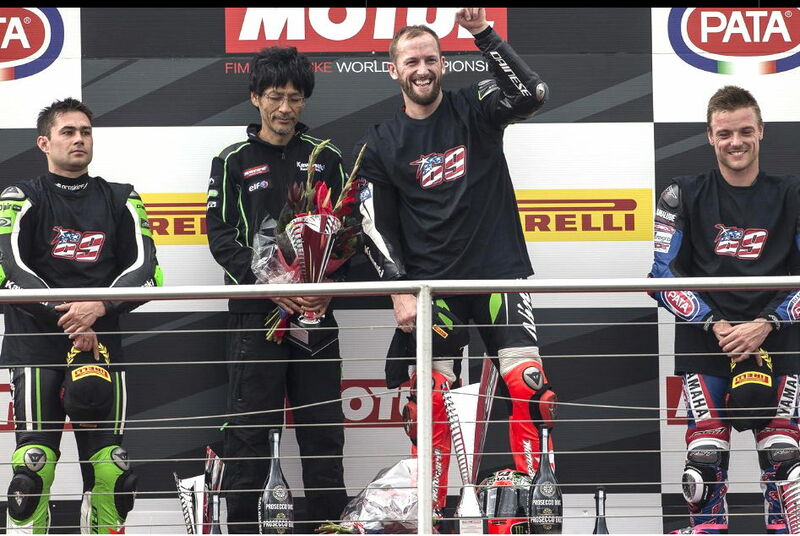 Rea won another WSBK race! re: “Rea won another WSBK race!” admittedly it was a hell of rally considering that Race 1 get off. Nice to see the Nicky tribute.